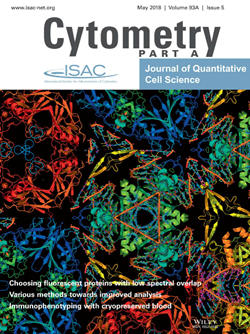 The May issue of Cytometry Part A: Journal of Quantitative Cell Science is now available! In this May issue of Cytometry Part A read the editorial by our Editor-in-Chief Attila Tárnok, and learn about a major step towards functional single cell analysis. A guide to choosing fluorescent protein combinations for flow cytometric analysis based on spectral overlap. In this month’s Editor’s Choice article, Kleeman et al. guide researchers deciding on which fluorescent protein to use when creating a new reporter mouse or when testing fluorescent proteins that are being developed. The authors examine the performance of each fluorescent protein based on criteria such as brightness, degree of fluorescence spillover, and spreading error and demonstrate the utility of five fluorescent proteins with optimal characteristics for multicolor experiments, three of which can be easily used simultaneously. Quantification of β‐AR expression has the potential to become an essential tool in clinical practice to evaluate response to treatment, to monitor disease activity and to make disease prognostics as well as understanding molecular basis of β‐AR dysregulation. Here, Saygin et al. describe an optimized method that will allow for large‐scale flow cytometric quantification of relative β‐AR expression on peripheral blood cells. There is still controversy whether total androgen suppression by surgical castration prolongs survival patients with progressive prostate cancer. In this issue, Pang et al. use in vivo flow cytometry to monitor metastasis in tumor mouse models and to assess the curative effects of androgen deprivation therapy by surgical castration. Read all articles included in this issue here.